...so I can more easily what it's doing. For example, plans A, C and D above involve progressing on combined interval duration up to a practical limit (often based on available training time) followed by increases in intensity. You might also notice that plans A and D are similar with plan A requiring more substitution of intensity for time and with only a light dusting of 40/20 vs a dedicated day for this lactate clearing workout. 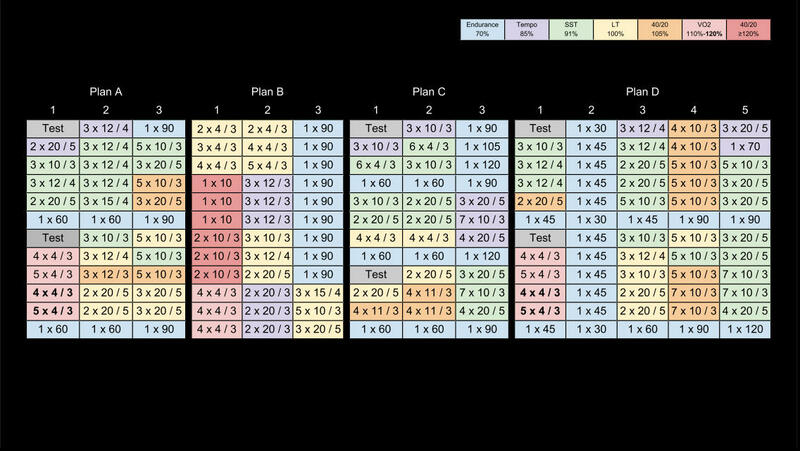 Plan C is not altogether different but does have a more conservative ramp rate. Plan B is more about easing into threshold ==> VO2 to raise ceiling ==> longer threshold work. So what's my point? I guess training plans just aren't that difficult to understand if they're based on something and if they aren't difficult to understand then perhaps some folks might become more comfortable making changes to them and monitoring load and making adjustments and learn more. One argument is that new cyclists will improve no matter what they do so I say that if they are going to improve anyway then why not start with something they understand so maybe they begin to start the process of learning earlier I dunno. Do rows represent weeks, and columns represent training days? So A, B, C are 3x per week plans, and D is 5x per week? Yes that's it exactly. Thanks. Sorry, what's after / ? "3 x 10 / 3" means 3 times 10 minutes, and what's the last 3? Rest between 10 minutes intervals? Yes that's correct! Also, for 40/20 intervals 2 x 10 / 3 = 2 x [10 x (40/20)] / 3. Why there are two different types of 40/20? Also, may be its only me, but the pictures are the same now and both displaying plans A,B,C,D. Good question! Lower intensity 40/20 is intended as more of a lactate clearing exercise (like an over-under) while higher intensity is more like HIIT. Edit - ...and I fixed the screenshot. Thanks for heads up!! Thank you, I liked those tables very much. They need to be sticked somewhere! I completely agree with the approach. I don't have much experience in cycling training plans, but for running it's basically the same. All training plans could be decoded as combination of long runs/tempo/vo2max/strides. I think many pre-canned plans are adding too much unnecessary complexity. May be it's required in order to charge for them :) Or may be some people find just having 4-5 types of workouts too boring. Glad you like the tables :) It's great to hear feedback. I actually made this post because of feedback I was getting about an old version of this I'd done elsewhere so it's always great to hear from folks. Regarding the illusion of sophistication that complexity gives so people can charge for it, etc. yeah I agree wholeheartedly but people have to put their kids thru college somehow I guess. Also regarding boring yep absolutely. This is one of my favorite video segments on this very subject of the problem of simple/boring and people haha!